The Isle of Wight has suffered from a lack of investment into the “Island-Line” railway for many decades. 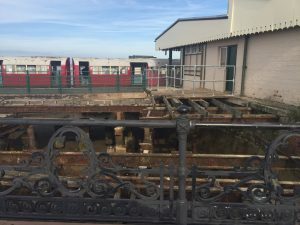 The rolling stock used on the only existing island-line between Ryde Pier Head and Shanklin, are ex-London Northern Line, Class 483 underground electric rail carriages which were constructed between 1938-40 (80 years old). Several attempts at improving this railway that serves only the North East of the island have failed. It is thought that the tracks and some tunnels are also at the stage where complete replacement is required. 80 years of neglect has rendered Island-Line virtually unoperable. Option A/ The above situation means many tens of millions of pounds will be required to upgrade the ‘Island-Line” to a standard similar to that expected to operate trains, that would be used on the mainland lines. Some island rail bridges and tunnels would also have to be rebuilt in order to handle the larger rolling stock. 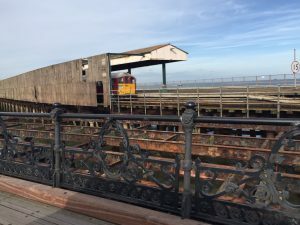 Any potential IOW Fixed Link Railway based tunnel would need to connect with an island based rail track system in order to continue its journey throughout the island. At present the island does not have that possibility, as there is no existing island wide railway. Option B/ Another potential plan could be to continue to manage the Island-Line on existing tracks, with upgraded similar sized rolling stock. 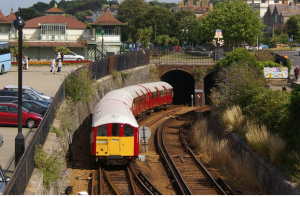 In this case, any potential IOW Fixed Link Railway based tunnel would need to cease at the island portal, in order to have the passenger transferred onto the “Island-line” train. 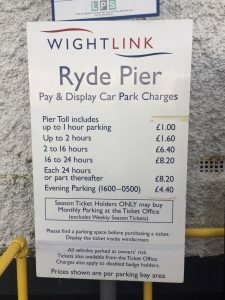 This option would require the construction of a new railway station including vehicle parking facilities at the Island Portal location, most likely at Ryde. The existing present day railway stations are surrounded by existing housing and road infrastructure and would not be available to have a tunnel portal constructed nearby. The conclusion is, that neither of these two options to have the Island-Line connected to a railway based cross Solent Fixed Link, are able to be realised due to high costs of construction/operation and lack of required space nearby the existing railway. Once a train reached the island…. it would have nowhere to go. During May 2016, this letter was sent to a local polititian by PRO-LINK, after being asked why we are not in favour of a rail link based fixed link…. “The Business case for a Rail Link. There were 8.5 million single journeys as foot passengers in total across the Solent in 2015. There needs to be good capital/return viability for build of project, to create an overwhelming business case for private equity investors/central government. With a rail tunnel, the freight will mainly be passengers and small packages. Both ends will require a station and commuter parking of sorts for transfers through the tunnel. If we use this 8.5m figure and disperse it among the Yarmouth – Lymington (Y-L) route, the East Cowes – Southampton (EC-S) route, the West Cowes – Southampton (WC-S) route, the Fishbourne – Portsmouth (F-P) route, the Ryde – Portsmouth route (R-P) and the HoverTravel (HT)…. it has 6 routes to be divided into it for passenger purposes. If a Ryde based rail link is instated to the Portsmouth/Gosport area that will reduce some of the existing HT, R-P, F-P route numbers. 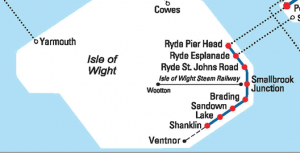 Unless a rail link is continued around the island, the rail passenger numbers would predominantly be from East Wight. For arguments sake let’s say as indicated, that the approximate usage of the rail link would be 45% of total passenger numbers across the Solent which makes it 3.8m. With the added convenience, the uplift in numbers may be 20% higher. Let’s say then, 4.6million in passenger numbers one way……2.3 million return journeys. The average cost at present for a return passenger ferry fare is around £20. 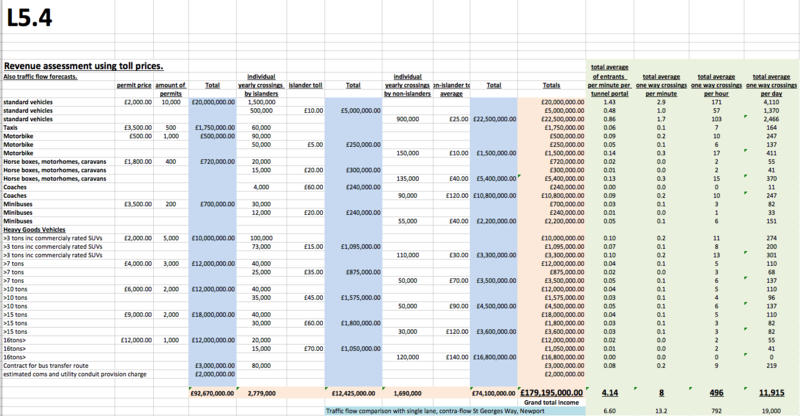 If that ticket price for the rail journey was replicated we have 2.3m X £20 = £46m. If we say the capital outlay for a rail tunnel including upgrading of the Island Line and stations is similar to that of a road based tunnel, we have just one quarter of revenue but overheads of staffing, ticketing, maintenance, etc will be significantly higher than a road based tunnel. The trains would only operate as scheduled, much like the ferry companies do now. The Island-Line route serves only a small fraction of island towns. The Island-Line route only serves a small fraction of island towns. The railway companies have a habit of industrial action causing strikes. Large freight will not be able to be carried. Inefficient transfer of modes of transport to and from stations (mainland and island) will create lack of fluidity of motion. Commuter parking will be required and be most likely charged for. Private equity funding to create a rail link will not be possible with high capital input, high overhead ongoings and low revenue income. Government funding would be doubtful too considering the minimal benefits to the overall economy and meagre potential uplift in the island business rate tax take and reduction in welfare subsidies. In the past, a rail based tunnel has been considered the most diplomatic option for an IOW fixed link, however the overall socio-economic benefit is small and the business model is severely flawed. 24 hour instant availability for tourism and business / commuters / healthcare / education / social reasons. constant and environmentally friendly, fluid motion of vehicles. public transportation from anywhere on the island, to varied destinations via electric buses. Commuter parking for vehicles at both the island and mainland sides, can cause great financial hardship for the customer. the ability to carry large freight. four times the revenue than a rail based link. an opportunity to upgrade the island road network including implementing a vehicular Medina Crossing and East-West Cowes pedestrian subway. There were no subsequent queries once this letter had been read.